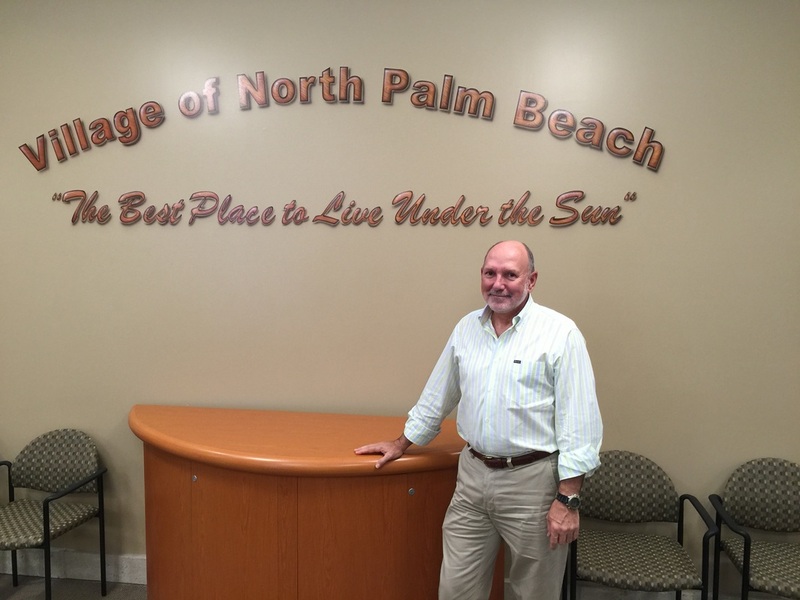 Village of North Palm Beach Mayor Robert Gebbia sat down with me in the Village Council Chambers recently and neatly summarized the challenge the city faces. How do you maintain the feel of a "Mayberry RFD" and set the foundation for future growth at the same time? Gebbia, who has served on both the council and as mayor for the last six years, talked about the unique characteristics of the Village it has in common with the much-beloved TV show, starting Andy Griffith. "We have a home town feel," Gebbia said. "People know people. In some cases we have four generations of the same family making their home here. The children and grand-children of the parents who came here to work for (aerospace company) Pratt and Whitney are living here" because of the lifestyle the Village offers. Still, Gebbia understands the need for growth. "We want to protect what we have," he said, "but you can't age in place. You have to continue to improve." As the Village prepares to celebrate its 60th birthday on Heritage Day, April 2, the process for mapping out the Village's future is already well under way. Residents were recently presented a 10-year Master Plan developed in partnership with the Village by the Treasure Coast Regional Planning Council. More of a vision and series of proposals at this point, it will help guide the council's decision-making process over the coming months and years. It's a process that will be heavily influenced by resident opinions and feedback, which Gebbia sees as a crucial and vital part of the mix. Getting citizen participation has not been a problem, In fact, the TCRPC gave the Village high marks in that department, saying the hearings here had more people attend than any other they've done. Along those lines, Gebbia praised the 100-plus people who have stepped forward to serve willingly on various boards and committees. "They are an incredible resource," he said. "Amazing, dedicated and knowledgeable." One of the first decisions to be made is what to do with the Country Club. The current building is now 50 years old and has the maintenance issues that go with its age, Gebbia pointed out. "The issue is scale," said Gebbia. "It must be well built and at a size that covers the cost." First and foremost, he said, is has to serve the needs of the residents, and serve as a community center as well. He said those decisions will be made in the next 90 days. One of the ideas that surfaced during the Master Plan hearings was the idea of water taxis, since the Village enjoys miles of waterfront. In fact, of the 5.8 square miles the Village covers, 2.2 square miles are water. While there are challenges to putting water taxis in place, Gebbia sees the potential. "You could actually run a water taxi all the way to Clematis Street," he said. The water also gives the Village some unique ecological benefits, he noted, including rare sea grasses and mangrove trees. Water is also a big part of Gebbia's personal time. An avid water sports enthusiast, he enjoys sailing, fishing and diving. That was one of factors that guided his decision to relocate in North Palm Beach from Orlando in late 2003. "I drove the entire coastline of Florida looking for the best place to be," Gebbia Said. "I decided North Palm Beach was it." While his tenure as mayor ends soon, he will continue to serve on the council, which he praised for its unified approach to managing the Village. "We are more like a Board of Directors," Gebbia said. While they debate the pros and cons, once a decision is made "everyone supports it." And the future of the Village? With its evenly distributed affordable housing, a top notch police and fire department, dedicated leadership and small town feel, Gebbia is ready to help take the next steps. "Once the plan is in place, you want it to be succeed." "We want to protect what we have," he said, "but you can't age in place. You have to continue to improve."